Topshop's Chiffon is one that I'd never seen before so I couldn't resist picking it up. In the bottle it looks slightly iridescent, which is what drew me in. It's a soft, baby pink but not too pale that it's hard to wear. Topshop polishes are quickly becoming my favourite, and as usual the brush is the perfect size and three coats gives you an even, opaque finish. I did find though, that the iridescence I saw in the bottle didn't really translate but all is forgiven because the final look is a really pearly, satin effect that I really like. What do you think? This is a beautiful colour! Very springy! I love Topshop nail varnishes! I've never used any Topshop polishes before! 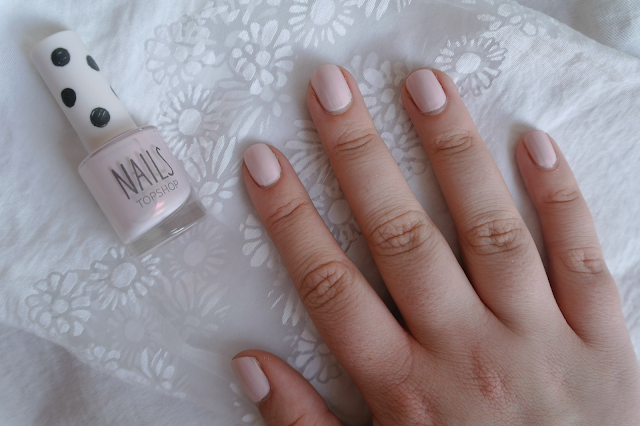 This is such a cute shade, so perfect for Spring and Summer! That shade looks really nice on you. I just came across your blog and I absolutely love it :) Your photography is stunning as well!